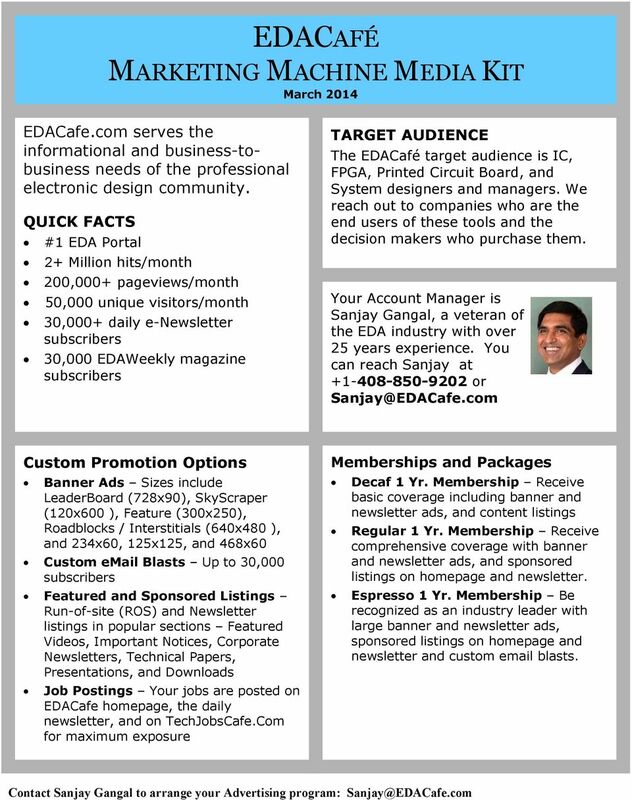 Download "EDACAFÉ MARKETING MACHINE MEDIA KIT March 2014"
1 EDACAFÉ MARKETING MACHINE MEDIA KIT March 2014 EDACafe.com serves the informational and business-tobusiness needs of the professional electronic design community. 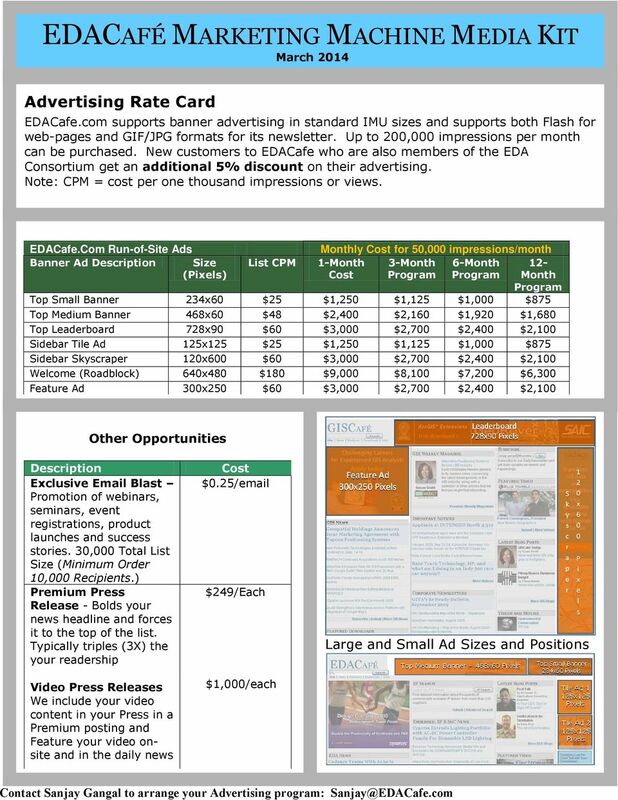 QUICK FACTS #1 EDA Portal 2+ Million hits/month 200,000+ pageviews/month 50,000 unique visitors/month 30,000+ daily e-newsletter subscribers 30,000 EDAWeekly magazine subscribers TARGET AUDIENCE The EDACafé target audience is IC, FPGA, Printed Circuit Board, and System designers and managers. 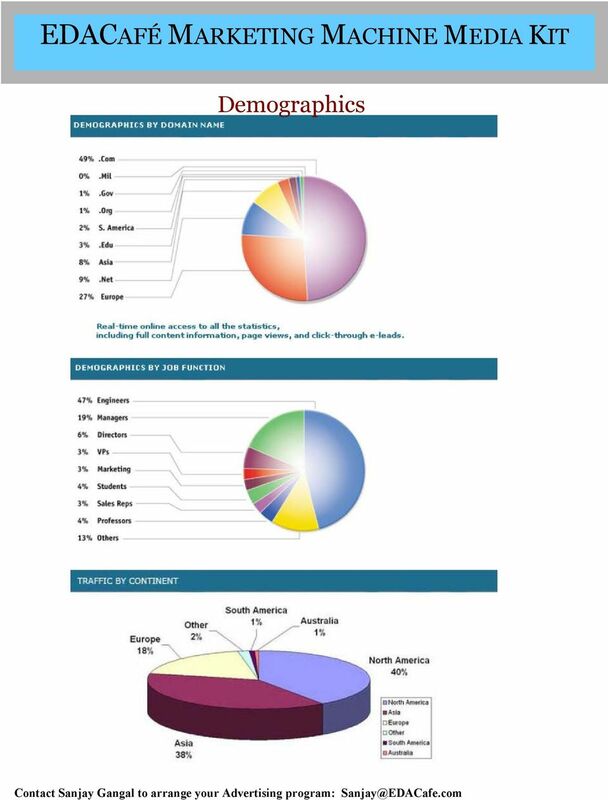 We reach out to companies who are the end users of these tools and the decision makers who purchase them. 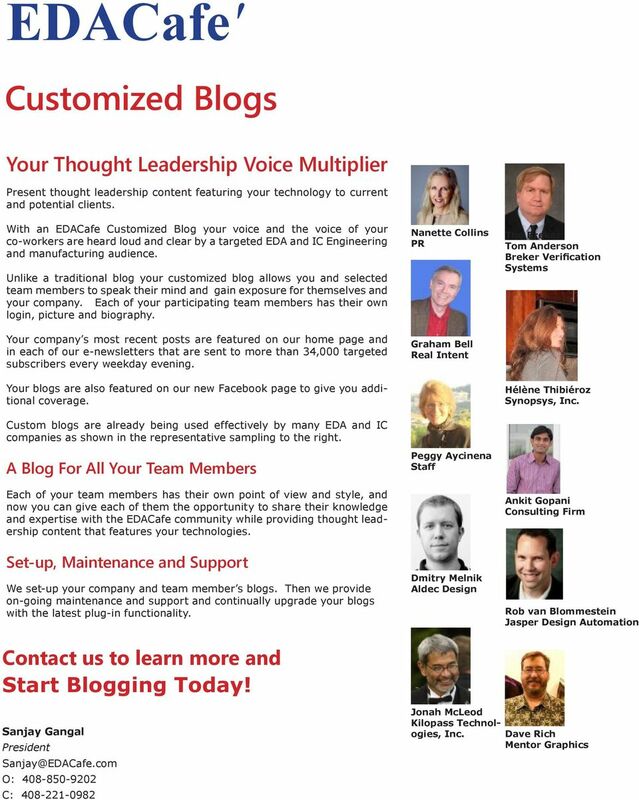 Your Account Manager is Sanjay Gangal, a veteran of the EDA industry with over 25 years experience. You can reach Sanjay at or Custom Promotion Options Banner Ads Sizes include LeaderBoard (728x90), SkyScraper (120x600 ), Feature (300x250), Roadblocks / Interstitials (640x480 ), and 234x60, 125x125, and 468x60 Custom Blasts Up to 30,000 subscribers Featured and Sponsored Listings Run-of-site (ROS) and Newsletter listings in popular sections Featured Videos, Important Notices, Corporate Newsletters, Technical Papers, Presentations, and Downloads Job Postings Your jobs are posted on EDACafe homepage, the daily newsletter, and on TechJobsCafe.Com for maximum exposure Memberships and Packages Decaf 1 Yr. 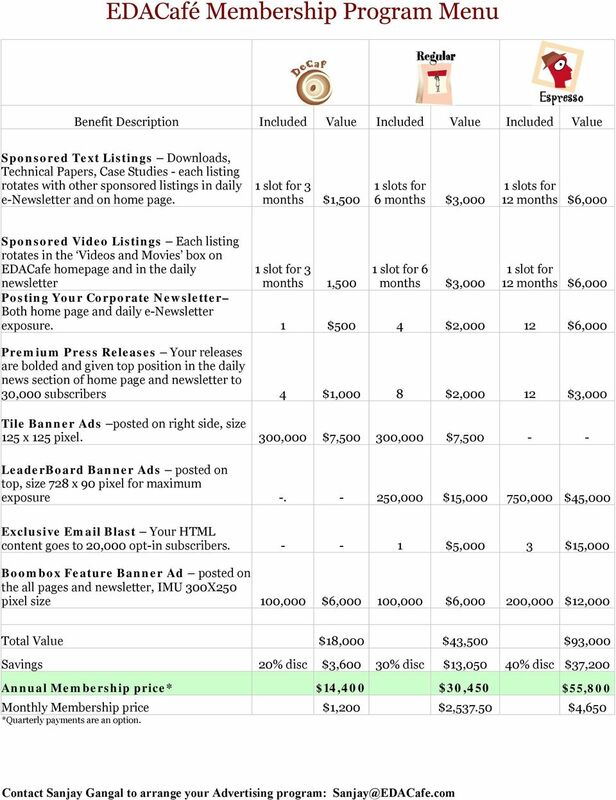 Membership Receive basic coverage including banner and newsletter ads, and content listings Regular 1 Yr. 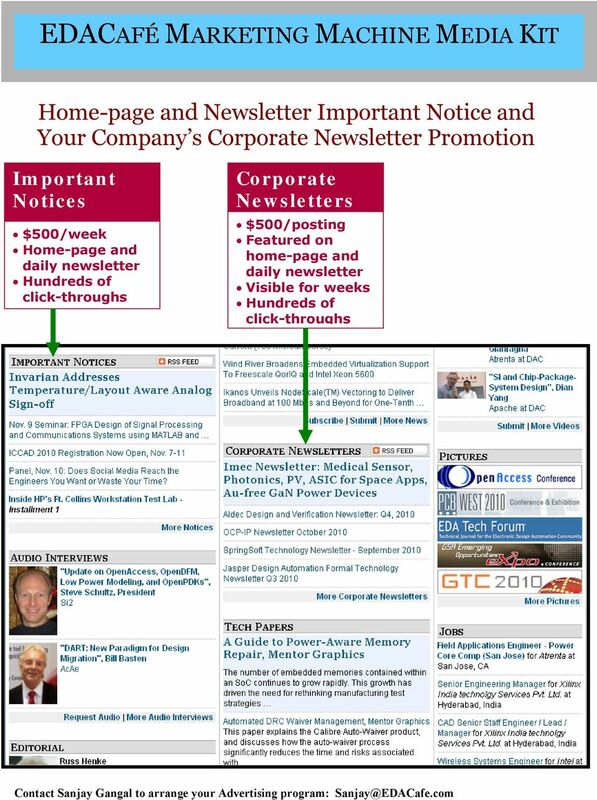 Membership Receive comprehensive coverage with banner and newsletter ads, and sponsored listings on homepage and newsletter. Espresso 1 Yr. Membership Be recognized as an industry leader with large banner and newsletter ads, sponsored listings on homepage and newsletter and custom blasts. 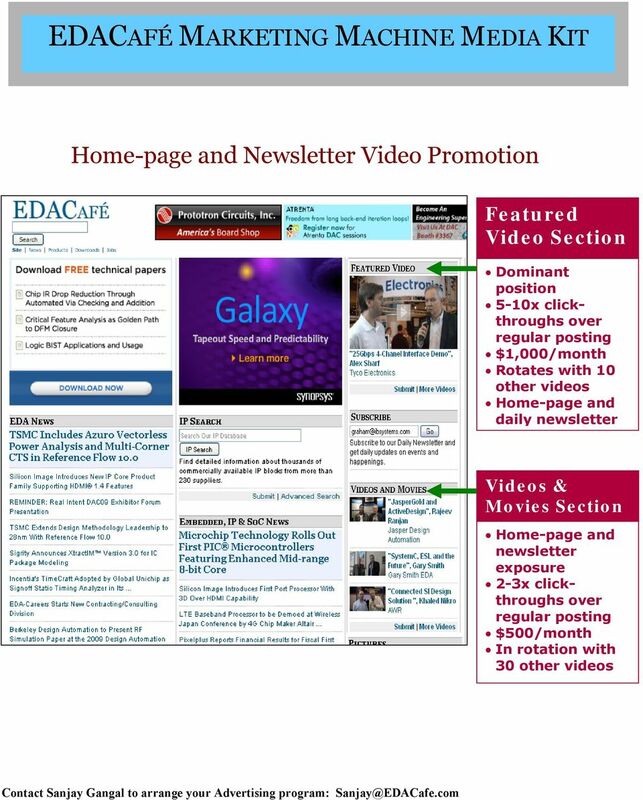 3 EDACafé Membership Program Menu Benefit Description Included Value Included Value Included Value Sponsored Text Listings Downloads, Technical Papers, Case Studies - each listing rotates with other sponsored listings in daily e-newsletter and on home page. 1 slot for 3 months $1,500 1 slots for 6 months $3,000 1 slots for 12 months $6,000 Sponsored Video Listings Each listing rotates in the Videos and Movies box on EDACafe homepage and in the daily newsletter 1 slot for 3 months 1,500 1 slot for 6 months $3,000 1 slot for 12 months $6,000 Posting Your Corporate Newsletter Both home page and daily e-newsletter exposure. 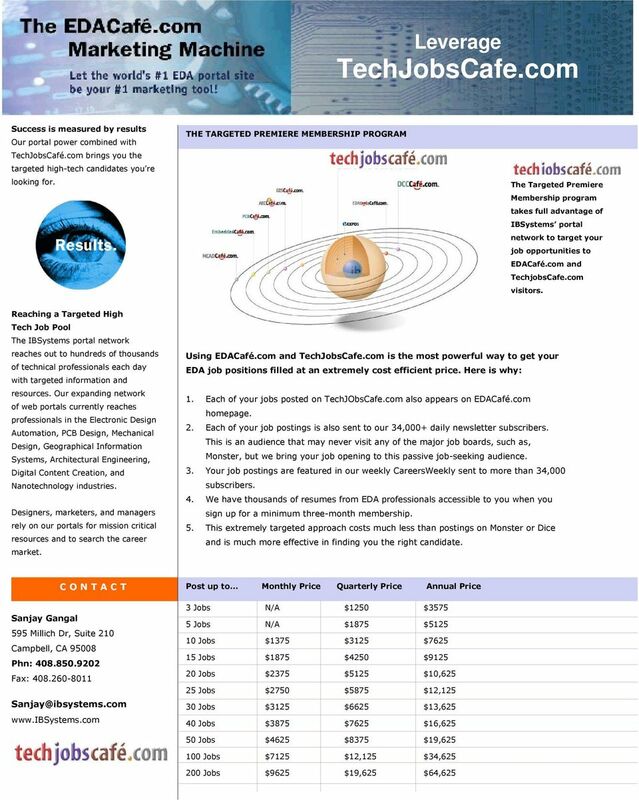 1 $500 4 $2, $6,000 Premium Press Releases Your releases are bolded and given top position in the daily news section of home page and newsletter to 30,000 subscribers 4 $1,000 8 $2, $3,000 Tile Banner Ads posted on right side, size 125 x 125 pixel. 300,000 $7, ,000 $7, LeaderBoard Banner Ads posted on top, size 728 x 90 pixel for maximum exposure ,000 $15, ,000 $45,000 Exclusive Blast Your HTML content goes to 20,000 opt-in subscribers $5,000 3 $15,000 Boombox Feature Banner Ad posted on the all pages and newsletter, IMU 300X250 pixel size 100,000 $6, ,000 $6, ,000 $12,000 Total Value $18,000 $43,500 $93,000 Savings 20% disc $3,600 30% disc $13,050 40% disc $37,200 Annual Membership price* $14,400 $30,450 $55,800 Monthly Membership price $1,200 $2, $4,650 *Quarterly payments are an option. Crosscut Media Kit. Because an informed public is essential to solving the civic and political challenges of our time. www.agbell.org 2016 MEDIA KIT Reach thousands of parents, educators and hearing health care providers in the deaf and hard of hearing community. ICOR VISION Through education, community, and support, anyone can achieve the lifestyle they desire.